With its shimmering azure waters framed by the rocky peaks of the surrounding White Mountains, Kournas Lake is the island’s only freshwater lake and the centerpiece of one of Crete’s most picturesque landscapes. A tranquil retreat for both locals and visitors, Kournas Lake is at its best in the summer months, when the receding water levels reveal vast white sand beaches and popular pastimes include swimming, sailing, canoeing and hiking around the lakeside. Kournas Lake is also a Natura 2000 preservation area and renowned for its bird and marine life, with a huge variety of species including water snakes, herons, cormorants and the rare Diamondback Terrapin. Kournas Lake is located in west Crete, 4 km from Georgioupolis. In one day you have a chance to see two most beautiful cities of West Crete and have fun on the natural lake!During this tour you will visit one of the most diverse cultural centers of Greece, the city of Chania, walk in the picturesque Rethymno town, swim in clean waters of the lake Kournas. Our professional guides will give you all the historical information during your bus ride and will advise you about the best activities and must-see spots. It is up to you, how to spend your time at each destination: to have a lunch, visit a museum, do some shopping, or just walk with a guide and listen to some more interesting stories. One and a half hour to enjoy each unforgettable stop and full freedom of choose how to spend this time! Book now and discover West Crete with Status MLB! * Pick-up (from the specific bus stops outside of your hotel) is arranged after booking. From villages of the North Heraklion region (Agia Pelagia, Gouves, Hersonissos,etc). For other areas, contact us. Get to know the west side of the island in a guided tour, enjoying a morning bus trip towards the cosmopolitan town of Rethymno, followed by a visit to Chania, the little “Venice” of Crete. 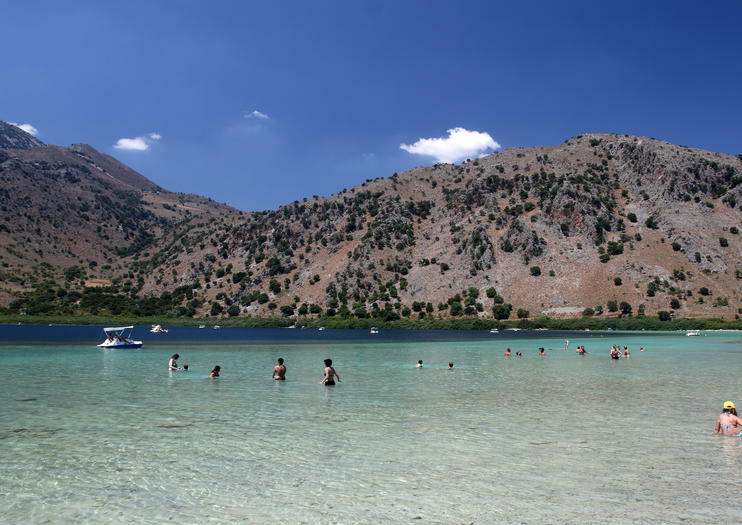 Complete your day trip to the picturesque lake of Kournas, the Crete’s only freshwater lake. Beautiful walk through the most wonderful places in the city, visit to well-known attractions as well as a could of hidden gems which will make you fall in love with Rethymno! Have the opportunity to visit the only fresh water natural lake in the island of Crete, where you will relax and have a coffee break in a local taverna. You will admire the beauty of nature by riding a pedalo and for the brave ones by swimming into the lake with the ducks and the turtles. Next is the main destination the winery, where you will have a tour in the courtyard, the botanical garden and then to the production and storage area of the wines, to learn all the secrets of production and bottling. Then you will taste the delicacies of Crete in a light lunch with local wine. Kournas Lake - Argiroupolis - Georgioupolis The first stop of the trip is at a local oil mill. Here you will have the opportunity to see how our famous olive oil is produced. The second stop is at the charming white chapel dedicated to Saint Nicholas in the village of Georgioupolis. This is the most photographed landmarks in this part of Crete. The church was built about a century ago on a rocky islet about 100 meters into sea. Continuing on, we make a quick stop at the waterfalls of Argyroupolis. These waterfalls are responsible for the rich vegetation that surrounds the village. It is a magical and refreshing experience. The last stop of the trip is at the lake of Kournas. Here we stop for about 2 hours. You will have enough time to enjoy a swim and eat Cretan delicacies at the many taverns that are located around the lake. Kournas Lake is the only freshwater lake in Crete. The lake is in a beautiful landscape, lying in a valley among the hills, Lake Kournas is relatively small, with a maximum length of 1,087 m. Kournas Lake is the ideal place for an walk or a day trip nearby. The landscape is lovely and relaxing, whether you want to go for a walk in the countryside, swim or ride a pedalo on the lake. Monastery of Agia Triada, the Tzagarolon Monastery, a patriarchal monastery, is still in function and is now one of the most important monasteries on Crete, with a huge impact on the culture of the island.At the same place you can visit the Folk Museum where it is hosted on the ground floor, also visit the cellar with the famous wines produced by the monks where you can also try and buy if you want.Venizelos family tombs:One of the most popular spots offering a panoramic view of Chania is the Venizelos family tombs. Enjoy this magnificent tour of South Crete! The first stop is at Kournas Lake, surrounded by the famous “white mountains”. Then we visit the village of Argiroupoli which combines natural beauty and history. The area is famous for its springs with waterfalls, its old mils and the lash green landscape.Then we reach the wonderful village of Plakias by the sea where you can enjoy a swim or have lunch. Afterwards we will visit the well-known monastery of Preveli. On our way back you will have the chance to admire the breathtaking Kourtaliotiko gorge. This trip gives us a possibility to visit the most beautiful places on Crete in one day. While we will drive from Eastern Crete to West, our guides will show you places which we will pass nearby. You'll learn many interesting facts about Cretan nature, history, culture.